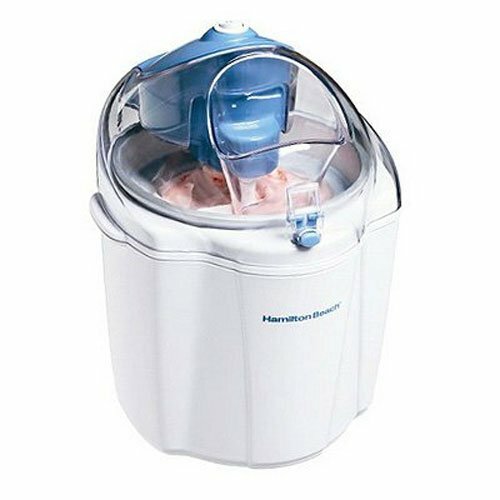 Make homemade ice cream, frozen yogurt, gelato, sorbet and more using this machine from Hamilton Beach. It’s fully automatic – no stirring and no need for ice or salt like the old-fashioned machines. An extra-large ingredient opening lets you add candies, brownie bits or fruit during the mixing process. Other features include a gel canister that fits easily in the freezer, an outer bowl that prevents condensation buildup on the counter and an Easy-lock lid. Wow! This makes the very best ice cream EVER! Try recipes that have eggs in them, and require a bit of cooking. The chocolate recipe that came with the machine wasn’t that special. Invest in a recipe book to get the full value out of this machine. Very compact (fits in kitchen cupboard), and the canister doesn’t even take up that much room in our drawer-type freezer.